Here are seventeen stories of urban fantasy by today’s leading science fiction and fantasy authors that introduce you to some of those other were-creatures, the ones hiding in the dark background shadows, waiting to bite. Join Seanan McGuire, Ashley McConnell, Susan Jett, Eliora Smith, David B. Coe, April Steenburgh, Gini Koch, Mike Barretta, Elizabeth Kite, Danielle Ackley-McPhail, Jean Marie Ward, Katharine Kerr, Sarah Brand, Anneliese Belmond, Faith Hunter, Patricia Bray, and Phyllis Ames as they take you into the hidden corners of our world to see some lesser known were-creatures. You may want to bring along some silver … just in case. Any anthology edited by Bray and Palmatier have become insta-buys for me. This is the third anthology from these two and, again, I was not disappointed. 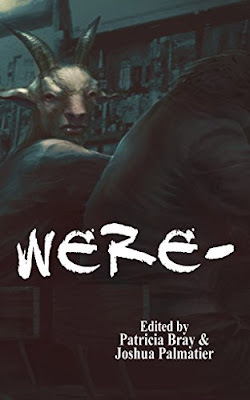 The first two anthologies are The Modern Fae's Guide to Surviving Humanity (sheep review) and After Hours: Tales from Ur-Bar (sheep review -Trivia: this was the very first review I did for I Smell Sheep). Were- was one I helped bring to life via the kick starter campaign. Bray and Palmatier manage to recruit some of the top authors in urban fantasy and science fiction. You really can't go wrong with any of these anthologies. Back to Were-, the stories range from 5 sheep to 3 1/2 sheep, most on the high end of the scale. And as the title suggests, all the stories are about were-creatures. But not the ordinary kind...these are unusual weres: crows, possums, wasps and some I won't mention because they are surprises. All the stories are fun (you can tell the authors had a good time playing with this theme) and some do have slight dark edge to them, but they all the werecreatures have happy endings. Were- starts out with a bang with "Best is Show" by Seanan McGuire. The story is a fun detective story with a were-twist. Beast from Faith Hunter's Jane Yellowrock series is as cheeky as ever and David Coe writes about some naughty little bears. Belmond's "The Whale" addresses the issue of mass differences between a person and their were form that I've always wondered about. These are just a few of the great stories.